← Be careful, don’t make a mess! I have heard many teachers say if they could go back in time and and redo their first year of teaching, they would change a number of things. I think student choice is something I would focus more on if I could go back and redo that first year in grade 2! I have read and followed Carol Ann Tomlinson’s work on Differentiation for several years now. 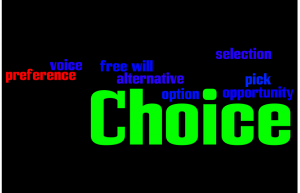 One of the elements that I have tried to embrace in my classroom is student choice in order to differentiate by interest. This can be done in terms of content, process, product, and many other areas in the classroom. I believe giving students a choice in the class is one of the most powerful tools we can arm them with; encouraging creativity and independence. They then have ownership in the class and believe their thoughts and ideas are valued in a safe and accepting environment. I know there is more, at least I hope there is! Students have a voice and we should guide them in making responsible choices for themselves regarding their learning! This entry was posted in Math, Reading, science, unit of inquiry, writing and tagged choice, differentiation. Bookmark the permalink. I like your idea about choice. Allowing students to assist in making these choices provides them with some ownership which will hopefully lead to more engaged learning.